First time troubleshooting with PCSX2, so I apologize if the formatting is incorrect or something is missing. Moving platforms (barrels) won't spawn. This happened later in the level and did not occur this soon until I went to recreate the bug. Jumping to their intended location proves that they aren't simply invisible either. Camera angle suddenly shifts to below Sly aiming upward. It cannot be controlled unless you a) turn on the binocucom or b) jump, but this only allows you to regain control until you land again. UI is messed up in the top corner. I know that there has been at least one other thread about this issue, though I've been okay with it even when it continually occurred in Sly 2: Band of Thieves. I thought it might be good to kill as many birds with one stone as possible anyway. Any help on that would be great, but remember that the actual game bugs are the priority. Extract and drag it to your current PCSX2 folder; then report back here for any changes. On the core settings, set VUs Round Mode to Nearest and VUs Clamping Mode to Extra, it fix some issues in the game, I have it so I will see if I can reproduce the issue. If it don't dolve this issue, try the latest build mentioned by CK1. My inexperience is my downfall. Downloaded latest version, extracted all files and dragged them into folder, now an error. This has opened a new can of worms. Any suggestions? (10-06-2017, 05:58 AM)Atomic83 Wrote: On the core settings, set VUs Round Mode to Nearest and VUs Clamping Mode to Extra, it fix some issues in the game, I have it so I will see if I can reproduce the issue. I'll give this a try once I've gotten the emulator to work again. Not sure where I would find that file location. There's no folder like that under the OS(C:), so where would that be exactly? Again, very new to fixing these issues so I apologize for the lack of direction. 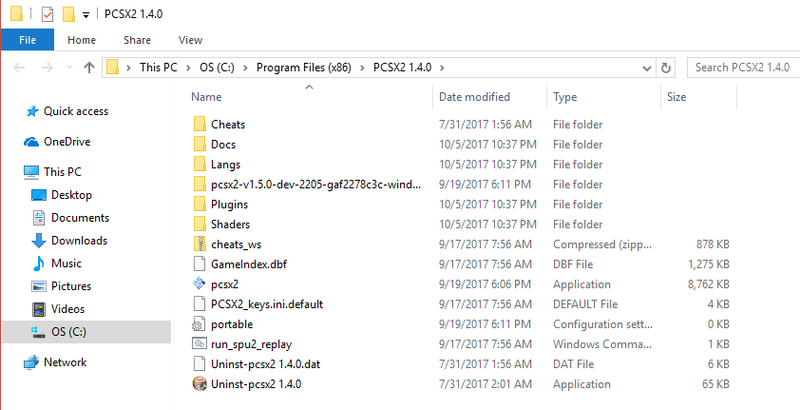 Since I've already moved the git files into the PCSX2 folder under Program Files (x86) and replaced some of the original items with the 1.5.0 version, will I have to redownload the emulator entirely for it to work again? This refers to the error I had up above. no, just create a new folder in your c: disk, and extract pcsx2 git version in it. It should be fine this way. globally, installing pcsx2 in program files isn't avery good idea. I went back and corrected the issue I made with the emulator and then tried your suggestion. This fixed the parts that were unplayably buggy, so many thanks! (10-06-2017, 11:15 AM)jesalvein Wrote: hem. I've installed the 1.5.0 version, but as just stated, I found a solution to the main problems I had. I'll still probably set up the new version at a later time, so thank you. Do you believe that v1.5.0 would solve the minor bug in the UI though? (10-06-2017, 11:50 AM)Nightowl Wrote: I've installed the 1.5.0 version, but as just stated, I found a solution to the main problems I had. I'll still probably set up the new version at a later time, so thank you. No idea since i never played this game using pcsx2. It need the fix that I had post in the GameDB section the last week.